Free Shipping to the U.S.A.! This is a set of 5/8" marbles for our Aggravation games. 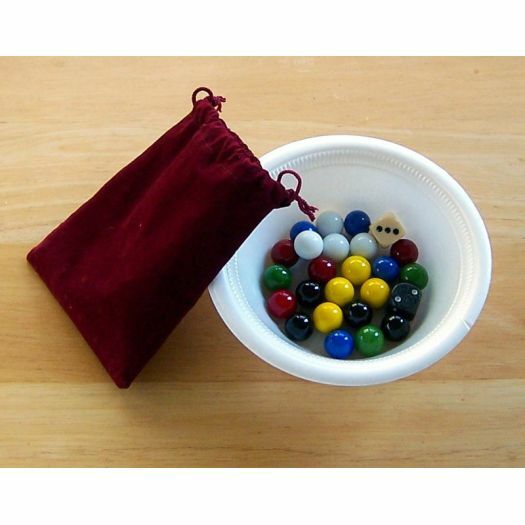 Includes 24 marbles of 6 different colors in a velvet pouch, enough marbles for 6 players, and two dice in a drawstring pouch. ♦ 24 marbles of six different colors. Marbles are 5/8" diameter. Colors are red, green, blue, yellow, black, and white. ♦ One velvet drawstring pouch to store the marbles and dice. A quick note. 5/8" is larger than 9/16". People have asked me if I had the 'larger' 9/16" marbles! 5/8" is actually 10/16"
Free Shipping to the continental United States. For Canadian orders, you must purchase 3 sets to qualify for free shipping. Contact us. Bought these beautiful marbles (which came in a velvet bag) for a game called Aggravation. It’s actually an old game that used to come with real marbles. Unfortunately today plastic marbles are included. The game and the marbles were a big hit with the birthday girl! They were delivered quickly and exactly what I wanted. I was impressed with everything about my purchase...the quality of the item and I received it in a timely manner. I would definately buy from him again. had "Lost my Marbles" for my Aggravation Game and was so happy to find your website. Received my marbles in remarkable time. Your customer service is wonderful. Thank You! The marbles are JUST like the original ones..NO difference! You were the ONLY one that I could find that sold them. Quickly got to me too. Thanks! Exactly what I was looking for. These are slightly larger than the regular marbles and that is what I needed. Excellent service and fast shipping.